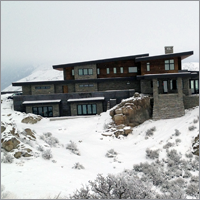 Vital Power Systems is completing work on the Boise Foothills NetZero project. 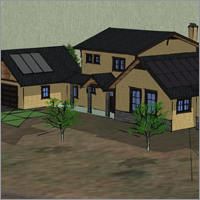 After initially providing Passive House computer analysis of the home, VPS was able to provide the homeowner with a renewable energy package that makes this architecturally profound home into a true net zero project. Additionally, the homeowners will be able to shift extra solar power production to their business and reduce business costs as well as eliminating their home power bills. A 22 Kilowatt photo-voltaic system provides the homes’ electricity. An eight panel, solar thermal system is the main source for the radiant heated floors and powers the home. This “power plant” is discreetly built on the roof of an adjacent garage to protect the aesthetics of this gorgeous home. Jug Mountain NetZero is situated on the Jug Mountain golf course and has stunning views of the surrounding mountains. Cross country skiing trails are right out the back door and the home provides instant access to miles of skiing, biking and hiking trails. “We know that an active lifestyle is so important to homeowners in this community and we wanted to build a home that supports that lifestyle and is elegant and efficient,” add Maimer. The home sports a 6.5 kilowatt Photo-voltaic system that powers the radiant heated floors, electrical systems and excess power is shipped to the electric car chargers in the garage. Intus windows and doors are used throughout the home to provide spectacular views and still maximize efficiency. Computer modeling of window placement and roof eaves ensures that the windows maximize heat gain in the winter and keeps the home cool in the summer. A stunning Intus folding window wall connects the main living with the sunroom. 14 inch thick, double insulated walls keep the cold out and the warm in. The homeowner can keep the house as warm as they wantthe power is free thanks to the solar systems that provide ample electricity. Beautiful local stone and timber adorn the house and local building products were utilized on all phases of the home. Reducing the embedded environmental costs was a consideration throughout construction. The main focus was to eliminate electrical and energy bills and this home will save the homeowner approximately $5000 annually over a comparably sized home. Vital Power Systems has been selected to build the Environmental Control Units (ECU) for testing of next generation buildings for the US Army. The Army is searching for ways to reduce fuel consumption and Vital Power Systems is using its expertise in deployable, energy systems to outfit the Energy Efficient Modular Buildings (EEMB). The military has standardized on JP8 fuel (similar to diesel fuel) for electrical generators and vehicles. The risk to human life and the dollar cost of transporting fuel to camps and bases in many countries is very high and thus economically justifies a much wider range of newer technologies than for commercial/institutional facilities. The use of commercial smart-managed generation, batteries, renewables, and insulated shelters (to replace tents) may reduce U.S. Army base fuel consumption by 30% to 60%. This initial Smart and Green Energy (SAGE) project utilizes a 150-person Baseline Camp and a 150-person Test Camp at the Systems Integration Laboratory (SIL) at Fort Devens, Massachusetts. Vital Power Systems is outfitting rapidly deployable, modular buildings with ultra-efficient lighting, heating/cooling and power management systems. Vital Power Systems will attend the annual STAR-TIDES conference in Washington, DC from Oct 3-8. VPS will be a featured presenter on their work in designing and installing solar power systems in Afghanistan. Vital Power Systems completed solar power systems training for our local Afghan partners. Our local team then installed a power system in less than 45 minutes and provided electricity to power a school of 1100 children. The solar power system provides robust electricity and is capable of powering all the lighting, fans, computer and internet services at the school. Locked and Loaded. Vital Power Systems is on track to install numerous solar power systems in eastern Afghanistan during the summer and fall of 2011. Seven pallets of solar power systems just left the VPS warehouse bound for Jalalabad, Afghanistan. The systems are designed to be installed in conflict areas and provide power for villagers’ basic needs.